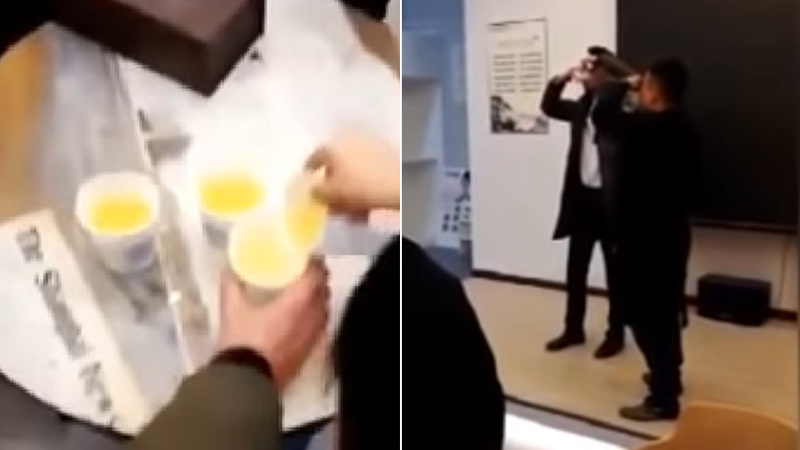 Last year, China made the headlines because one of their companies forced its employees to drink their own urine and eat cockroaches. Why? Well, because they failed to achieve their sales targets. Now, since it’s a new year, you would probably think that they’ll try better ways to urge their workers to be more efficient. Turns out, they’re doing the same old thing by turning up the torture by a notch. According to Daily Mail, the streets of Tengzhou, eastern China were populated by not only cars, but also people on all fours. Pedestrians were shocked by this scene and recorded the incident. The crawling people (mostly female) were employees of a beauty product selling company who had failed to meet their targets. The group was being led by a male supervisor, who held a flag bearing the firm’s name. And to make matters worse, two other workers were walking alongside the group to film the punishment. Thankfully, someone called the police and they demanded the “leader” of the team to stop the punishment before issuing him a verbal warning. Reportedly, the company has been ordered to halt business and requested to introspect about how they’re treating their employees. Because what they’re doing is literally criminal. According to China’s employment contract law, employers aren’t allowed to humiliate and give corporal punishment to workers. Additionally, the employer is liable for compensation if any harm is done to the worker. Disclaimer: Viewer discretion is advised. It’s understandable to have certain deadlines and monthly targets. But after years of human evolution, if an employer’s best way of motivating people is making them crawl on the streets, then it isn’t the employees who are failing. It’s the employer. So, let’s pray this is the last we hear of Chinese companies mistreating their people and hope they come up with better ways to boost sales.